Halloween scares are silly compared to the real world. The universe is a really scary place, considering the potential for random disasters that could wipe out life on earth or at least a large segment of it. Supernovas, asteroid impacts, tsunamis, and tornadoes are far scarier than a kid wearing a mask. The other day I saw my cat terrorizing and killing a baby squirrel, and I thought to myself how harsh the universe can be for living organisms. That particular animal never had a chance. One would think humans would always be comforting and helpful to each other because the universe is so unforgiving. History shows just the opposite is often true. Humans kill other humans–a behavioral trait inherited from their evolutionary ancestors. During the 20th century this frightening trait was illustrated in 2 world wars that left 67 million people dead. 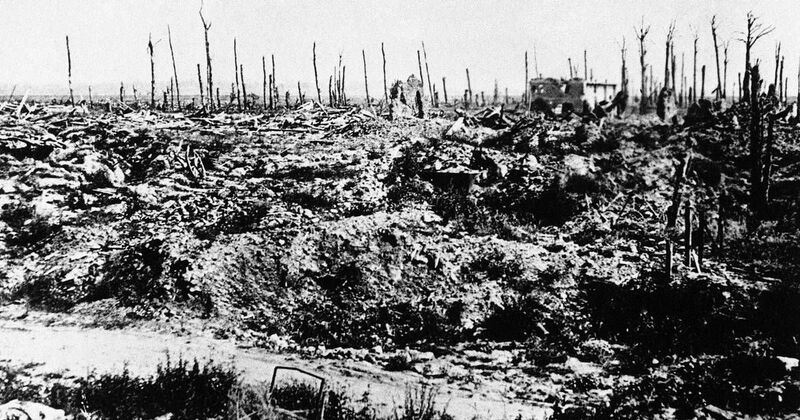 No man’s land on a battlefield in France during WWI. Imagine being ordered to cross this into an hail of burning steel. Before the widespread strategic use of tanks trench warfare resulted in years of bloody stalemate on the Western front during WWI. World War II caused more deaths than WWI, but battles in the earlier conflict were bloodier. Men fought in static lines of trenches before the widespread use of tanks. During WWII mobile tank warfare led to breakthroughs when many army divisions could be surrounded and thousands of troops would be forced to surrender. Being in a prisoner of war camp sucked, but it was better than death. But during WWI generals tried to break through enemy trench lines by bum-rushing opposing trenches with a mass of soldiers. It was like forcing living human flesh through a meat grinder. At the sound of a whistle 20 year old men were ordered to run across a devastated landscape known as “no man’s land.” They ran into machine gun fire, artillery barrages, minefields, barbed wire, and poison gas. Men were slaughtered and these attacks frequently failed. Death notices were sent to thousands of families, following these futile offensives. 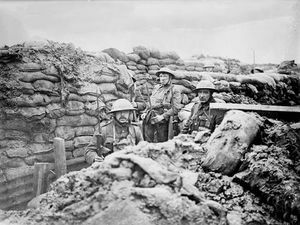 Just think how terrifying it was for these young men to know they were facing near certain death at the sound of a whistle. The short lifespan of troops participating in trench warfare selected for an unusual strain of virus. Most influenza viruses are not that deadly because if the host dies rapidly, fewer virus spores will survive to infect other hosts. 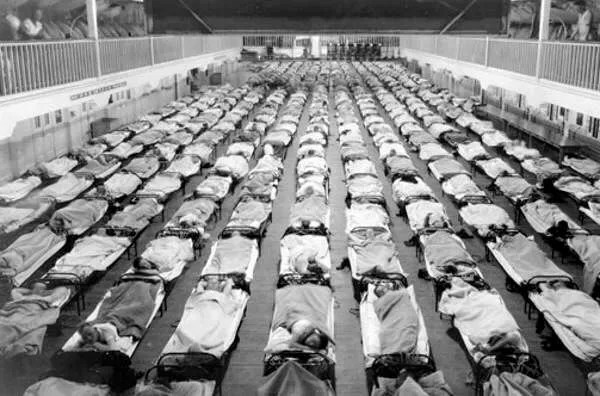 But hosts were dying rapidly in WWI trenches, and a virulent strain of virus, known as the Spanish flu, was just as likely to infect other hosts as the less virulent strains. The virus began to spread in the spring of 1918. Demobilization during the fall of 1918 when soldiers rejoined the civilian world caused a surge in the pandemic. The Spanish flu continued to afflict the populations through the winter of 1919. 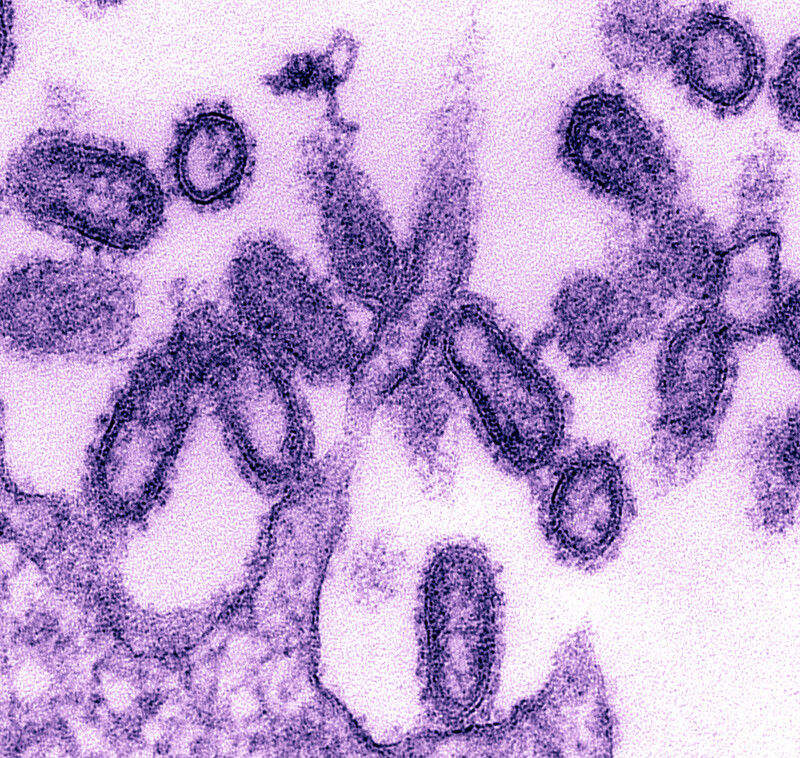 Scientists estimate this influenza virus killed 50-100 million people–probably more than both world wars combined. It infected 25% of the world population and had a mortality rate of 5%-10% (most influenza viruses have a mortality rate of .1%). Healthy people in their 20’s and 30’s suffered an higher mortality rate than the elderly who are usually more vulnerable to flu epidemics. Scientists think this flu strain was different from the initial flu strain this generation first encountered during the 1890’s, and their imprinted immune systems were maladapted for it. The Spanish flu virus may have killed up to 100 million people. I’m not afraid of vampires, werewolves, and witches; but the possibility of global war and disease pandemics are much more frightening to contemplate. Evolutionary biologists like to study rodent fossils. Rodents occur in high population numbers, and their rapid generational turnover means evolutionary change occurs faster than with larger slower breeding animals. Scientists recently studied pine vole teeth from 2 caves in Kentucky and 1 cave in Georgia that date to the last Ice Age and compared them with modern day pine vole teeth. Pine vole teeth from Hilltop and Cutoff Caves in Kentucky date to about 30,000 years ago, and the pine vole teeth from Yarbrough Cave in Georgia date to about 23,000 years ago. Pine voles are still a common species, occurring all across eastern North America. Despite their name, they prefer living in moist deciduous forests where they tunnel under tree roots and feed on roots, seeds, fruit, fungus, and insects. Their fossorial existence keeps them safe from owls and hawks, though snakes can enter their burrows. Pine voles are considered arvicolid rodents because their teeth cusps are in the shape of alternating triangles. Other common arvicolid rodents include meadow voles, lemmings, muskrats, and cotton rats. Pine voles weigh just an ounce. They mostly live underground but occasionally venture to the surface. Pine vole range. Pine vole is a misnomer. They prefer moist deciduous woods, not pine forests. Nobody knows why the common name is pine vole. The pine vole teeth from the Kentucky Caves show the pine voles living then were the same size as modern day pine voles living in the region. However, pine voles living in north Georgia during the Ice Age were larger than modern day Georgia pine voles and about the same size as northern pine voles. Scientists believe this was in response to colder temperatures. Bergmann’s rule states that animals living in colder climates generally grow to a larger size because they are better able to retain body heat. The authors of this study can’t determine whether this large size was the result of inbreeding with northern populations of larger pine voles that colonized the region or natural selection of the local population. Between 1989-1995 Lonnie and Freida Looper hunted for fossils on 19 different gravel bars along the Mississippi River during droughts when the bars became exposed. These gravel bars are located between Helena, Arkansas and Greenville, Mississippi. Thousands of years ago, the bones were quickly buried when glacial meltwater pulses flooded the Mississippi River Valley. The Mississippi River erodes this Pleistocene-aged sediment and deposits the soil and bones on the gravel bars. For years the Looper family sold replicas of their specimens, but they donated most of the actual specimens to Delta State University. I don’t think they still sell the replicas, though the Looper’s website remains on the internet. The Looper family discovered over 550 specimens including 27 species. A comprehensive study of their collection wasn’t published until 2017. The Looper family found this Jefferson’s ground sloth claw on a Mississippi River gravel bar exposed during a drought. During most of the late Pleistocene the Mississippi River entered the Mississippi River Valley through 3 gaps, but all of these flooded following the collapse of the ice dam that unleashed the waters of Lake Agassiz about 12,900 years ago. Before this the Mississippi River didn’t meander broadly like it does today. Instead, it was a series of braided channels clogged with sandbars because the water table was much lower then. Cold glacial meltwater pulses caused cool microclimates within the valley that favored mixed Ice Age woodlands of pine, spruce, ash, aspen, oak, hickory, willow, tamarack, herbs, and grass. Frequently flooded bottomlands and abandoned dried-out channels hosted alder thickets with beech, walnut, tulip, willow, and grass. Spruce and jack pine dominated drier upland sites. These were the types of habitats that supported the animal life represented in the Looper collection. Some of the species they found were not known to have occurred within the Mississippi River Valley including paleolama, stag-moose, helmeted musk-ox, giant short-faced bear, and manatee. Map of the Mississippi River Valley in relation to the ice sheet during the Last Glacial Maximum. This map doesn’t represent the land area that occupied the continental shelf then. The Mississippi River resembled this modern day braided river during the Ice Age. Paleolama mirifica was a species known from the coastal plains of South Carolina and Georgia, and throughout Florida; so the specimen found by the Looper family was a first for the region and evidence for a greater range than was previously known. The manatee was likely an accidental migrant that may have perished because it failed to go south during cool weather. Manatees can’t survive in water temperatures below 68 degrees F. The Looper family also collected bones of mammoth, mastodon, bison, white-tailed deer, long-nosed peccary, 2 species of extinct tapir, horse, beaver, giant beaver, Jefferson’s ground sloth, dire wolf, raccoon, black bear, giant tortoise, snapping turtle, soft-shelled turtle, unidentified bird, small-mouth buffalo fish, and flat-headed catfish. Bones of bison and deer were the most common. Nina Baghai-Riding, the lead author of this new study, thinks the Mississippi River Valley may have been a migratory corridor for some species. Cool microclimates along the river may have attracted fauna of northern affinities. 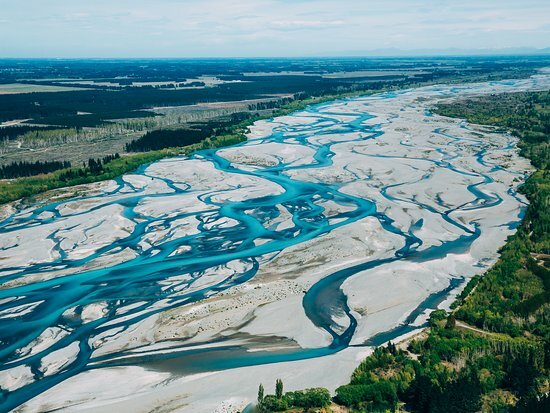 Rivers are also rich in food resources as well because a greater quantity and quality of vegetation can grow in more irrigated environments. The superior feeding opportunity attracted megafauna as well. How far South did the Extinct Stag-Moose (Cervalces scotti) Range During the Late Pleistocene? A species of extinct deer, slightly larger than a modern day moose (Alces alces), occurred south of the ice sheets during the late Pleistocene. It is alternatively known as stag-moose or elk-moose, but its scientific name is Cervalces scotti. This giant deer had the long nose of a moose, though its antlers were more like those of an elk. However, it shared a closer common ancestor with the former. They inhabited wetlands surrounded by mixed forests dominated by spruce but with significant elements of pine and hardwoods. Like modern day moose, they fed upon aquatic plants during summer and twigs during winter. Mastodons occupied a similar habitat and fed on the same foods, so the 2 species often co-occurred together. Evidence from the fossil record suggests stag-moose were particularly abundant in midwestern bogs left by retreating glaciers. Stag-moose bones are quite commonly found in Ohio, Indiana, Illinois, and New York. Surprisingly, they occurred even farther south with isolated fossil remains having been discovered in Virginia, Arkansas, Mississippi, and South Carolina. The stag-moose remains found in Desha and Philips County, Arkansas and Rosedale, Mississippi are at 34 degrees latitude. These consist of antler fragments and a jawbone with a tooth. The stag-moose specimen from Charleston, South Carolina (just a tooth) occurred at 32 degrees latitude. This is probably close to the southern limits of its former range because stag-moose remains are completely absent from sites in fossil rich Florida. 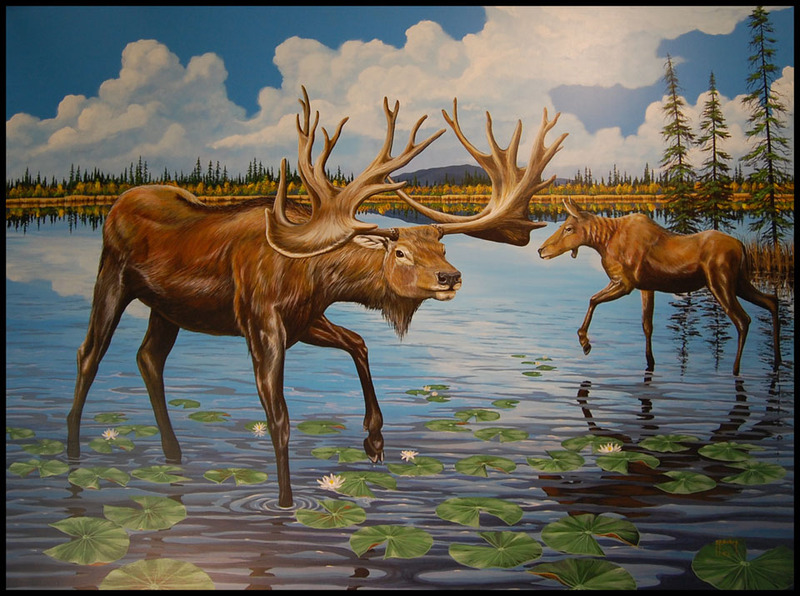 Artist’s depiction of the stag-moose. They were huge. That is a lot of venison. A stag-moose skeleton found in Chippewa Lake, Medina, Ohio had 1 bone that had attached sediment filled with pollen representing the type of environment it lived in. The pollen included fir, maple, alder, aspen, birch, hickory, hackberry, hazelnut, ironwood, pine, oak, basswood, elm, spruce, cedar, ragweed, grass, and cattail. Spruce pollen made up 60% of the total. It seems likely the type of environment favored by the stag-moose, as far south as Charleston, South Carolina, included various compositional ratios of these species. I hypothesize stag-moose occurred in the mid-south during cool moist interstadials rather than the coldest driest stages of Ice Ages. Wetlands would’ve been more common during these climatic phases. Full blown glacial maximums restricted stag-moose habitat because desert scrub and grassland habitat expanded then. Although there is no supporting archaeological evidence, I think overhunting by humans caused the extinction of the stag-moose. Man colonized North America when ice sheets covered most of Canada, thus restricting stag-moose to more temperate regions where humans became common enough to impact their populations. When the glaciers began to recede, optimal stag-moose habitat increased, but humans had already decimated their populations into extinction. Modern day moose crossed the Bering land bridge, and ecologically replaced the stag-moose and were able to survive in northern latitudes where human populations remained too scarce to overhunt them. You are currently browsing the GeorgiaBeforePeople blog archives for October, 2018.